There are some things in my closet that I consider “staples”- things I reach for over and over. Like underwear, basic black leggings, and that pair of jeans that have so many holes they’re past the point of being “fashionable”, but that you wear every wash cycle anyway, because they’re so dang comfy. These staples are the first thigns you pack on every vacation (ok, sad story: I did forget underwear once, on a trip to the coast, and ended up buying a pack that was 3 sizes too big becaue that was all the little town drug store had), and it might not even occur to you to sew them, since they’re so ubiquitous, and not the type of “flashy” sew that typically gets alot of likes on Facebook pages. Simple (non-racerback) tanks are on that list for me, and despite trying my hand at sewing everything from jeans to thongs, it had honestly never occurred to me to make my own- I’ve found the perfect variety at Old Navy, and couldn’t imagine getting a similar fit and function from a self sewn version. Fortunately, Angelyn was one step ahead of me again, and brought up the idea of creating a pattern for a basic shell. 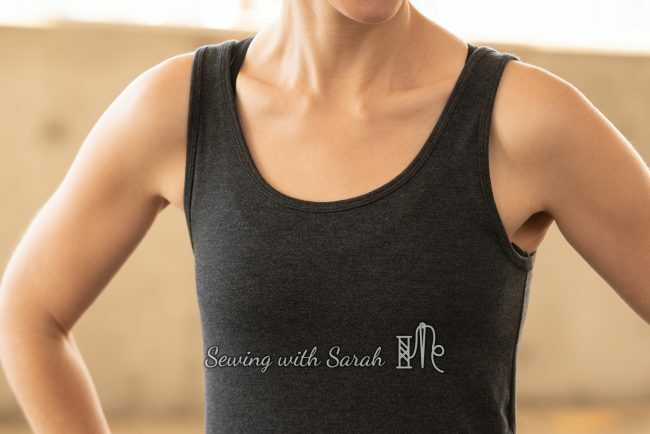 I thought, what the heck, I’ll give it a try- and was totally blown away by the great fit and instant gratification high of sewing my own “Staple Tank“. Tanks. Plural, because I’m on my fourth, and I just can’t stop. I previewed my first Staple Tank during the second edition of my FitCapsule (catch it here). This one was sewn in a really lightweight rib knit from So Sew English, that’s pretty much identical to my Old Navy versions. This is a very, very good thing, in case you’re wondering, and if more of that fabric pops up in other colors, you can be sure I”ll snap it up. I love how the low scooped back shows off the strappy version of the Power Bra (check out the SewAlong here). The Staple Tank pattern includes pieces and instructions for binding and banded options, but I prefer the binding. I used my signature binding method (tutorial here), and even though I’ve done it a hundred times by now, it still feels a little like magic. I have a binding attachment for my coverstitch machine I keep meaning to play with- but with results like this, it’s hard to feel motivated! My second tank is made from MVC fabric, also from So Sew English. If you’re unfamiliar with MVC, it’s basically the love child of bamboo/rayon jersey and cotton lycra- it irons well, has excellent drape, but also enough structure that it doesn’t tunnel or snag in your machine, like lightweight fabrics tend to do. I’m really hoping they stock more colors of the MVC soon- it’s fabulous for the hotter months. I styled it here with a brand new pair of Stride tights (made using the updated version- love that big pocket!) and a Sunday Cardigan. The color of these tights is so blinding its fantastic- I’m basically a running traffic cone in them, and I love it. I mean, you can’t beat that for safety! Just for fun-zies, I tried tie-ing the tank up in a little side knot. 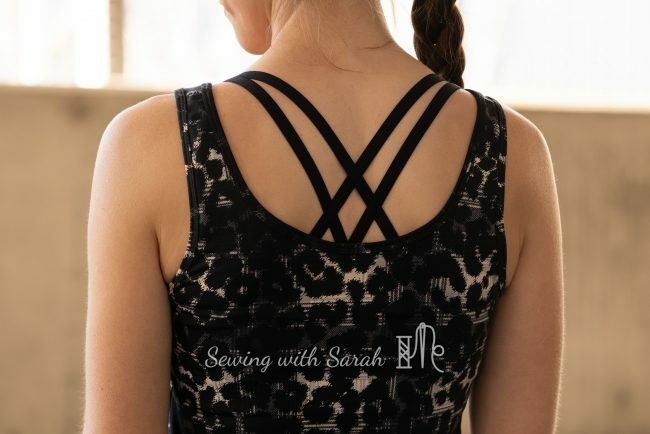 If you want to do this, I recommend flaring out the bottom a tad, and using a very stretchy hem stitch, so the stitches don’t pop while you’re tying (ask me how I know!). I find a wide two needle coverstitch does the job well, or a zig-zag/twin needle hem would also work. My third tank, and the most flashy, is made from a leopard (I think it’s leopard? Do I have my zoo animals right here?) print athletic knit from Surge Fabric Shop. 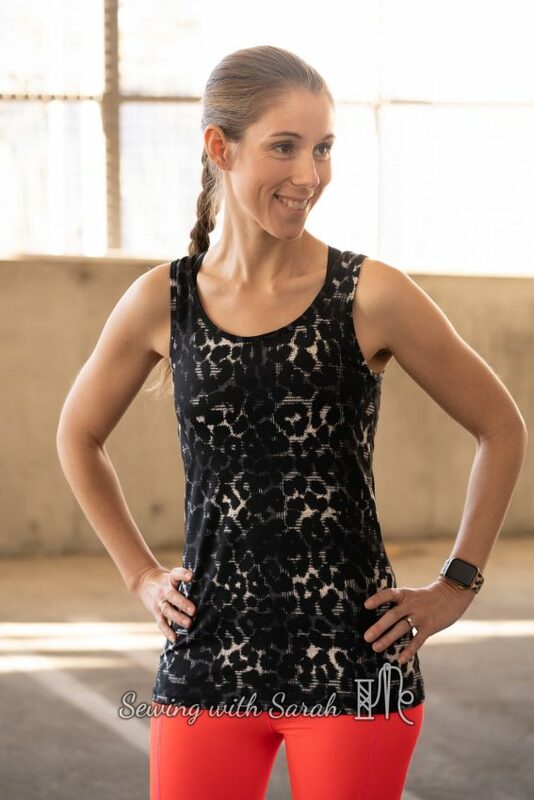 This is a lighter weight athletic, and would work well for leggings or tops- I chose to make it as a top, since I already had a fantastically flashy pair of animal print tights from this post. Finally, I made a fourth version in a heavier bamboo spandex knit from The Fabric Fairy. While I need to be careful which undergarments I select for the first two tanks, so they don’t show through, the heavier weight of this fabric (almost like a ponte) means its perfect for smoothing out any lumps or bumps, and perfectly well suited for wearing on its own, without an over-layer. Something I didn’t mention, and that may not apply to you, is that I love these tanks for nursing. It wasn’t until my third (and last!) baby that I learned the over/under method for keeping your tummy covered while feeding. Basically, by wearing a tank top underneath all outer layers that can’t be pulled down, I can be sure my #momtum is always covered in public- something that’s especially important to me in the colder months, when I don’t want to freeze! If you’re a nursing mom, the Staple Tank is perfect for the underlayer portion of this set-up, and the tanks obviously retain their use long after you’re done nursing. Well, what do you think? Do you like to sew “staples”, or do you prefer to buy them and focus on sewing more intricate/complicated things? I’d love to hear from you! Grab the Staple Tank pattern on sale HERE! Note: This post contains affiliate links, as well as my honest (and sometimes obnoxious) opinions. Thank you for your support!